This is ridicolous. I posted it first with proof. But my deal was taken off. 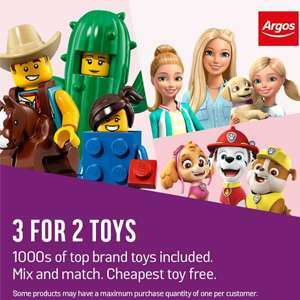 Argos on 8th 11:55PM "Remove all the discounts then apply promo 3 for 2 on all toys". I dont quite understand why people moan and complain about 342 and the prices going up to the Original catalogue price. Do you really think they will have two offers on at once. The same with voucher codes. You only use one voucher code at a time. Its standard practice. To take advantage of this offer you need to find 3 items that are relatively new on the market and hasnt dropped in price. I.e vetec unicorn. £45, will more than likely go up to £50 (rrp) when offer starts. Find two other toys for same value and it will bring the price down to £33.33. Its really not rocket science. Stop moaning or buy the toys now at the prices before they go up. Welcome to the world of hukd and mods doing exactly what they want when …Welcome to the world of hukd and mods doing exactly what they want when they want. I’ve had deals removed then they get posted and allowed a few times now. The situation was already explained to MayaForrester in that their deal was posted after the original and we credited them here with the information from their thread. As for your comment here, i've had a look and I can only see one thread being removed since 2015 and that was for a Misc thread. I'd be more than happy to review something, just drop me a PM and i'll be happy to take a look. What confirmation do you have? This is ridicolous. I posted it first with proof. But my deal was taken …This is ridicolous. I posted it first with proof. But my deal was taken off. I had just commented on yours, how was yours taken off yet this post states with credit to you? This explains why their toys have gone up to full price in the past couple of weeks The 3 for 2 will just bring them back in line with the likes of amazon. Does anyone know what time it normally goes live online to place a delivery order? Welcome to the world of hukd and mods doing exactly what they want when they want. I’ve had deals removed then they get posted and allowed a few times now. Yes the best bit about these Shargos 3 for 2 offers on their thin air *cough* I mean stock, is that the more reputable Amazon will price match and you only have to buy the single item you want to get 33% off. Plus Amazon have real stock rather than advertising thin air. Will the Lego advent calendars be included? Does anyone know what time it normally goes live online to place a …Does anyone know what time it normally goes live online to place a delivery order? When it was on in September this year it went live at 1am. Cold for me sick of these inflated prices they do on these deals. Yes the best bit about these Shargos 3 for 2 offers on their thin air …Yes the best bit about these Shargos 3 for 2 offers on their thin air *cough* I mean stock, is that the more reputable Amazon will price match and you only have to buy the single item you want to get 33% off. Plus Amazon have real stock rather than advertising thin air. used to be 33% when they matched 3 for 2 offers but in recent years, it was more like 30%. Wonder if they will remove all the good Lego again.. Think they removed it last week. Lego 75888 was £22.99 recently. Now £34.99 so 3 for 2 is £69.99 or £23.33 each. They don't pay tax though. Reserve the night before, check the prices before and after once the promotion has been applied. As the case maybe that Argos arent the cheapest as they hike up prices during this promo in the past. The situation was already explained to MayaForrester in that their deal …The situation was already explained to MayaForrester in that their deal was posted after the original and we credited them here with the information from their thread.As for your comment here, i've had a look and I can only see one thread being removed since 2015 and that was for a Misc thread. I'd be more than happy to review something, just drop me a PM and i'll be happy to take a look. I posted something this year a few months ago about bt raising their prices which was removed by a mod. For it then to reposted & allowed I even at the time brought it up and got no where. Does anyone know if Melissa and doug products are usually included in this offer? Everyone should do their homework before buying, I bought 3 bikes last 3 for 2 and it of course worked out a lot cheaper than buying them separately. Debenhams sale is also one to price check as often their prices are cheaper elsewhere even with 70% off! Does anyone know if gaming tablets are going to be included in this 3 for 2, or are they not toys? The 3 for 2 on the Lego is always epic prices I find. I hate that, I've had that done to me. Just checked several products that I have been looking at last week, it's clear that Argos put up the prices already before this offer starts on Friday. Ah the ever so special "bump up the prices and make em 3 for 2"..... All customers are so thick and they never cotton on to it EVER! Voted hot. Thanks for the heads up! is barbie included does anyone know . Does anyone know if kids drones normally go on 3 for 2? Are the advent calendars, most specifically Lego ones, normally included in the 3 for 2 deals? Thanks.